Artist’s illustration showing the scorching-hot exoplanet Kepler-13Ab, which circles very close to its host star, Kepler-13A. In the background is the star's binary companion, Kepler-13B; the third member of the multiple-star system is the orange dwarf star Kepler-13C. The weirdness of exoplanets continues to amaze. It snows titanium dioxide, one of the active ingredients in sunscreen, on one giant, scorching-hot alien world, a new study suggests. Artist’s impression showing the “hot Jupiter” exoplanet Kepler-13Ab’s size, compared to several planets in our solar system. Kepler-13Ab is six times more massive than Jupiter. The Hubble observations showed that temperatures higher up in Kepler-13Ab's atmosphere are cooler than those below — a surprising result, given that other "hot Jupiter" exoplanets tend to display the opposite pattern. 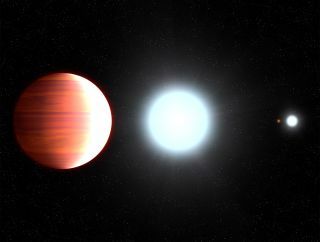 On most hot Jupiters, gaseous titanium dioxide in the dayside's upper atmosphere absorbs starlight and radiates this energy as heat, warming the air up. So, what's going on with Kepler-13Ab? The study team thinks that strong winds carry the planet's titanium dioxide around to the nightside, where the stuff cools and condenses into clouds. These clouds then drop the sunscreen "snow" into the lower atmosphere, where it stays, thanks to Kepler-13Ab's powerful gravity. "These observations of Kepler-13Ab are telling us how condensates and clouds form in the atmospheres of very hot Jupiters, and how gravity will affect the composition of an atmosphere," study lead author Thomas Beatty, an assistant research professor of astronomy at Pennsylvania State University, said in a statement. "When looking at these planets, you need to know not only how hot they are, but also what their gravity is like." The "cold trap" process invoked for Kepler-13Ab had never been seen in action on an exoplanet before, researchers said. The new study, which was published in the October 2017 issue of The Astronomical Journal, could eventually help astronomers better understand exoplanets more like our own, Beatty added. "In many ways, the atmospheric studies we're doing now on these gaseous, 'hot Jupiter' kinds of planets are test beds for how we're going to do atmospheric studies of terrestrial, Earth-like planets," he said in the same statement. "Understanding more about the atmospheres of these planets and how they work will help us when we study smaller planets that are harder to see and have more-complicated features in their atmospheres." As its name suggests, Kepler-13Ab was discovered by NASA's planet-hunting Kepler space telescope, back in 2011. The planet is part of a triple-star system that includes the hot Jupiter's host star, Kepler-13A, and two companion stars (Kepler-13B and Kepler-13C).